Ecuador’s new Superintendent of Information and Communication, veteran journalist Carlos Ochoa, is no passive bureaucrat. He makes very clear the political considerations behind the 2013 Communications Law, which his office was created to enforce. The theme is that ‘communication is a right’, a citizen’s right. Freedom of expression in Ecuador is no longer just the right of a large media corporation to publish what it likes, without social accountability. The new law, based on President Rafael Correa’s ‘Citizen’s Revolution’ and the 2008 Constitution, emphasises citizen’s rights, access to information, new spaces for participation in media, a fomenting of ‘plurality and diversity’ in media, the prohibition of media monopolies and banning media ownership by other economic sectors. It promotes participation and redress for Ecuador’s citizens. Television and radio licenses are, by law, being gradually redistributed towards a 33 /33 /34 mix between public, private and community sectors. Through its main agent, the Superintendence of Information and Communication, the law aims to create a democratic media culture. The political implications are never far away. Visiting Spanish politician Maite Mola pointed out: ‘If there is no democratisation of the media there is no democracy in the country’. I interviewed Carlos Ochoa in Quito on 25 November, 2014. Previous media law came from the era of the dictatorships, with censorship, closures and direct controls – many current journalists were trained under that regime. CO: “the new law of communication , rather than seeking to punish, is one that looks to prevent and educate, so that those media don’t have the absolute power they had before, and so they can be controlled like all other power … Most of the major media said they did not want a law, and that ‘the best law is one that doesn’t exist’. [Yet] 97% of [Radio and TV] frequencies were in private hands … with the law we are now at about 83% but, over time, we will have a redistribution … to that required by the law [Article 106], which is 33% for the private sector … 33% for the public sector and 34% for community groups. “For the community sector [with less resources] … they have created affirmative action measures, from the state … with credit to buy equipment … as well as advice and assistance, so they can maintain it … of course the public sector (including universities councils and districts) doesn’t need that. CO: “In Ecuador, the media groups were linked to the banks, commerce and industry … and they used these channels to pressure the government. The communications media installed and kicked out presidents … We had seven presidents in 10 years, most of them created by economic groups which had as their spear-head the communications media. Here in Ecuador we had one media director who, the day after the election of a democratic President, like him or not, ordered at the editorial desk the next day: ‘let’s kick out this crazy person’. “The media say they are not political organisms, but they make politics … they are using [their channels] as tools of opposition against progressive governments. [But] the new law prevents media owners having a relation to other sectors … they can be bankers, or media owners, but not both. “Before, in this country, there were three powers – executive, legislative and judicial, as in the old English system … with the new constitution there are not three but five functions – we don’t call them powers but functions – the executive function, the legislative function and the judicial function; now we’ve added two more, the function of transparency and social control and the function of electoral control. The function of transparency and social control brings together the superintendence of banking, the superintendence of companies, the superintendence of communication, the comptroller [general accounting office] … the peoples defender [a type of ombudsman, and others]. “Control and transparency, our role is to verify whether the media complies with the law … before, what happened in this country, [media owners] could invent stories against people … and no-one could say anything about it … and if there were [a right of reply] to a false story that had been on page 1, with 8 columns, there might be an apology on page 35 … saying ‘sorry we were wrong’. Professional ethics under the new law (Article 10) includes respect for human dignity, including reputation, honour and the intimacy of the family; proper conduct with groups, such as not inciting young people to engage in dangerous practices, avoiding all forms of discrimination; professional ethics including respecting the law, rejecting censorship and pressure, no abuse of office; and social practices such as respecting freedom of speech and criticism, but also the right to a fair trial, distinguishing between informative information and paid material. These are day to day matters addressed by Supercom. CO: “Now you can demand a right of reply, or a remedy … politics used to be organised just by the neo-liberal groups … only two candidates mattered, ‘the finalists’ … the rest of the candidates, the left of course, the communists, Pachakutik [one group of indigenous candidates] and others … could not generate their stories in the media, not even by paying … so the media had that power, putting in ministers, kicking out presidents, generating political economies favourable to their groups, all under the media power of the press – eight families controlled the majority of the [TV-radio] spectrum. The new law aims to create equal conditions [in the media]. This comes from Montecristi [the 2008 constitution], and was ratified by two citizens consultations. Q: Is there a right for media workers to participate in the management of their enterprise? Some Television channels have tried to conceal their cross-links, and have lost their licenses. Two of these were suspended at the time of this interview. The law makes clear that licenses are ‘concessions’ from the state, and are subject to renewal, as also that monopolies are banned, along with other economic enterprises owning media stations. Q: Those cross links could help sustain loss making media enterprises as the mouthpieces of business groups? Q: What is the objective of sanctions? CO: “As a Superintendence we want to educate to prevent, not to sanction … to educate the media and citizens. [For example] it is unacceptable that the Cronica Roja [a genre of crime and violence reporting with lurid and often bloody photos] is maintained as the exercise of a brutal narrative … normally it is humble people [who are targeted], they almost never use it on people with resources. [For example] people who suffer an accident, the next day they show the person lying amid tangled metal on page one … these sorts of things cannot continue in today’s journalism. “Another theme … it can’t be that children and adolescents are defamed … or people detained by the police are identified [and branded] …. before they have a trial. An emblematic case was with Tele Amazonia. A family lost its two children from inhaling gas, because of a bad connection. The media, led by Tele Amazonia, ran a type of ‘media lynching’ against this family, who not only had to suffer the pain of losing their children but were arrested and taken to jail, because the children supposedly died after a ‘satanic pact’ . With time it emerged that the children had died from inhaling gas because of a faulty connection. Until today, nobody [in the media] has publicly apologised to that family … that type of thing can’t go on in this country. Q: Yes but they have created a culture, no? There must be a cultural resistance to a type of social control, seeing it as censorship? Are you addressing this with some sort of promotion or education? Q: That’s why I asked about promotion and education on rights? There are the rights of the communication workers, and in the rest of society? “Often there are problems from ignorance … they ignore how they should manage information, such as the Cronica Roja, the rights of children and the handicapped … so rather than punishing we are generating a culture so that they can prepare, over a year, to know the law. We are not applying the law all at once. Q: The same place and size? 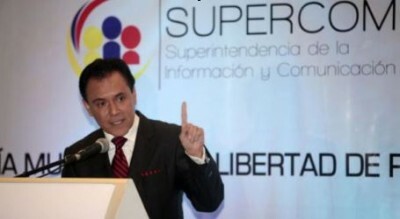 I referred to the recent, large international ‘Summit for Responsible Journalism’ (CUPRE: www.cuprecuador.com), held in the coastal city of Guayaquil. Over 2,000 attended, from seven South American countries. Supercom was not involved. This was organised by several government agencies, in particular the National Secretary of Communication (SECOM) and also the Union of South American Nations (UNASUR). Media reports about the conference varied widely. Q: In Ecuador I notice which papers I am reading. Q: Many don’t read newspapers at all. Q: But they do have influence on other media? Q: What sort of reception have you had?